Catch 22 is an unusual, wildly inventive comic novel about World War II and its publishers are planning considerable publicity for it. Set on the tiny island of Pianosa in the Mediterranean Sea, the novel is devoted to a long series of impossible, illogical adventures engaged in by the members of the 256th bombing squadron, an unlikely combat group whose fanatical commander, Colonel Cathcart, keeps increasing the men's quota of missions until they reach the ridiculous figure of 80. The book's central character is Captain Yossarian, the squadron's lead bombardier, who is surrounded at all times by the ironic and incomprehensible and who directs all his energies towards evading his odd role in the war. His companions are an even more peculiar lot: Lieutenant Scheisskopf, who loved to win parades; Major Major Major, the victim of a life-long series of practical jokes, beginning with his name; the mess officer, Milo Minderbinder, who built a food syndicate into an international cartel; and Major de Coverley whose mission in life was to rent apartments for the officers and enlisted men during their rest leaves. Eventually, after Cathcart has exterminated nearly all of Yossarian's buddies through the suicidal missions, Yossarian decides to desert -- and he succeeds. 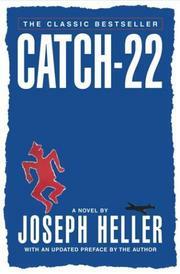 Catch -- 22 is also concerned with some of war's horrors and atrocities and it is at times painfully grim.